With views like this, impromptu singing of “the hills are alive…” happened a lot on this adventure. Pre-hike: Flew in late on July 1st and spent the night in Denver. Drove into Aspen the next day and talked to helpful people at Ute Mountaineer who had updates on trail conditions. We arrived that evening at our roomy digs at The Crestwood (pretty close to the trail head and not as pricey as accommodation options in Aspen) and started our hike on the morning of July 3rd. Post-hike: Drove to Aspen for an amazing burger and truffle fries (and cold beer) at the White House Tavern. Then drove about 18 miles north to Basalt and loved our stay at the Basalt Mountain Inn, oh and don’t miss a visit to the Xin Yu Massage next door. Ahhh, made it to the top of Frigid Air Pass. (L-R) Our new friend Aaron Stich, Kelly, Bettina, Maria, Suzanne, Judy. USDA guide and map. National Geographic Trails Illustrated Topographic Map And we bought a map when we got to Aspen at the Ute Mountaineer store and received some tips from the helpful staff. Food Notes: A new favorite snack from Suzanne was cheese flavored Halfpops. They’re delicious and the saltiness was a nice contrast to all the sweet energy bars. Also the cheddar-flavored Moon Cheese was, well, out of this world! Handily available at REI. Another convenient place we found a good selection of food for our trip was Target. A delicious dinner of Bettina’s was dried pea soup from the Wheatsville Food Co-OP to which she adds smoked, spicy chorizo. On day 3 hiking from Pats Lake to Everly Lake with Arrowhead Lake in the background. Photo by Kelly Fitzgibbon. Post-hike: Eat burgers, visit the hot springs and spend the night at The Beaver Lodge. In the morning drive back to Boise and catch the flight back to Austin. 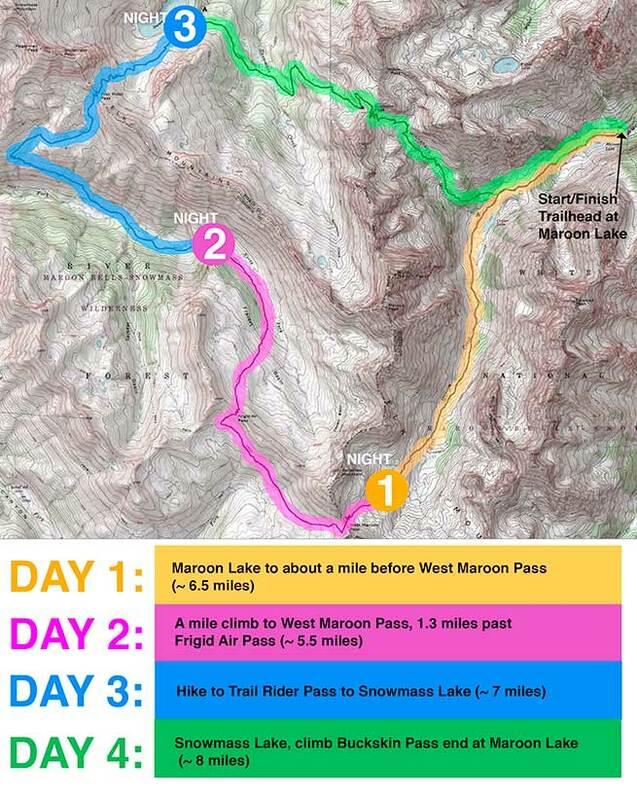 Special thanks to Michael Lanza and The Big Outside for his expert advice on this trip itinerary! 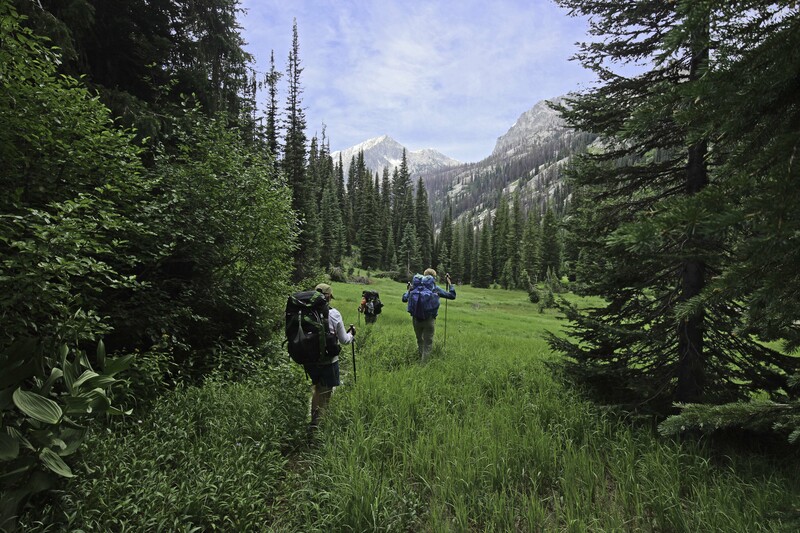 Hiking through a lush, grassy meadow on our way to Nanny Creek on day 5. Photo by Judy Paul. 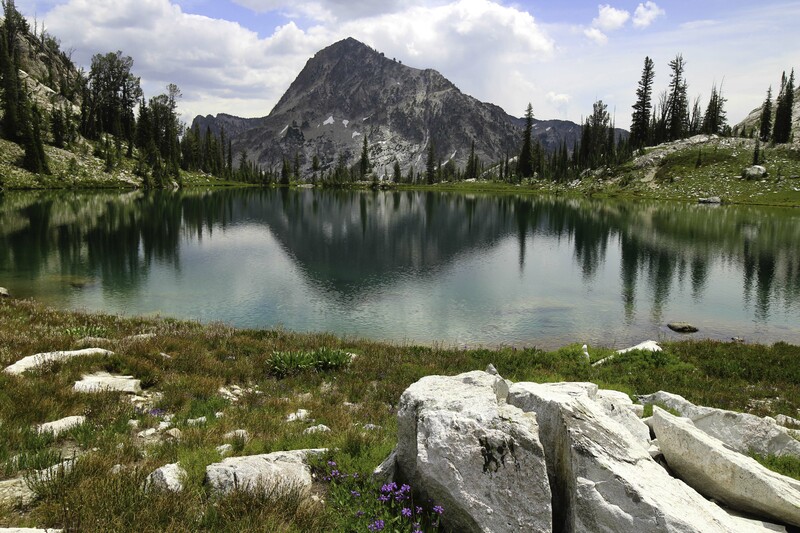 Beautiful alpine lake between Pats Lake and Everly Lake. Photo by Judy Paul. We were lucky enough to tour of some of the re-built, historic mining shacks lead by the artist/owner of the Atlanta School. Photo by Kelly Fitzgibbon. Atlanta Idaho is so far off the beaten path that we almost needed the compass to us get there from the Boise airport. 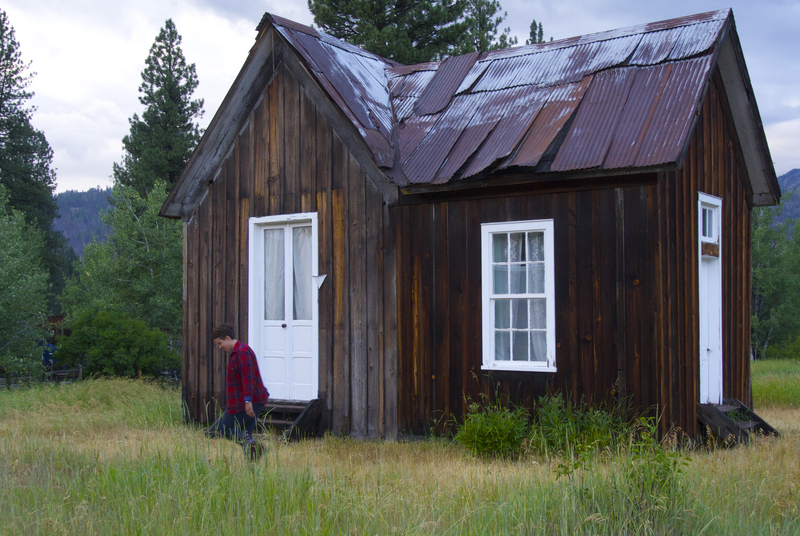 Exploring this charming, historic mining town was an unexpected bonus to our trip. We met the quintessential mom and pop owners of the Beaver Lodge and a friendly gang of artist on main street who spend their time making art and restoring mining shacks at the Atlanta School. Atlanta is just a short drive to the Queens River trailhead so after breakfast at the lodge we piled in the rent car and headed out. 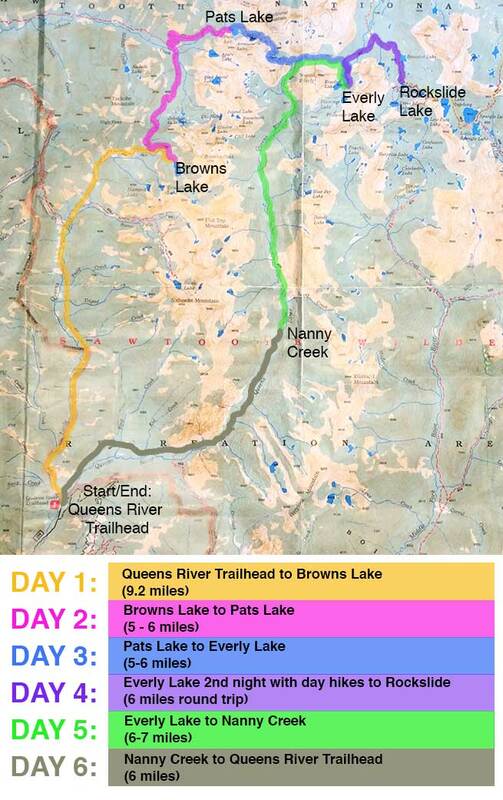 Once at the trailhead we completed the self-serve wilderness permit and started the 10 mile trek to Browns Lake. On our way we encountered a bear, lots of burned trees from the fire in 2013, beautiful wildflowers and the only people we would see for the entire rest of the trip. Four people total in six days. 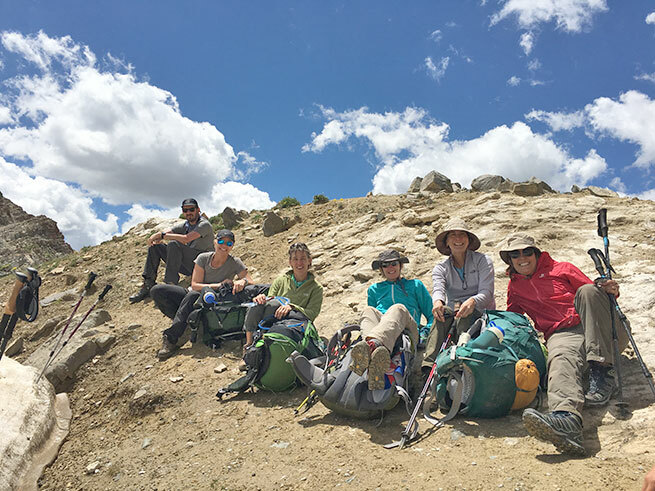 Day two brought us into higher attitudes with wide vistas of the stunning, jagged Sawtooths. As we made our way to Pats Lake we lost the trail when crossing a vast, lush meadow. We backtracked a bit, got out the compass, consulted the map, read the guidebook over and over and finally just went in the general direction we knew we needed to go and relocated the trail. This was the first of many times the trail seemingly disappeared. Eventually we weren’t that shocked when we got off track and mostly just kept going until the trail re-appeared. Navigational know-how, map, compass and guidebook were very helpful on this trip. By this point we were feeling pretty good about our outdoor skills such as using the PCT method of hanging our bear bags and when a huge dead tree fell one windless morning we were thankful we had decided that spot was too risky for our tents the night before. 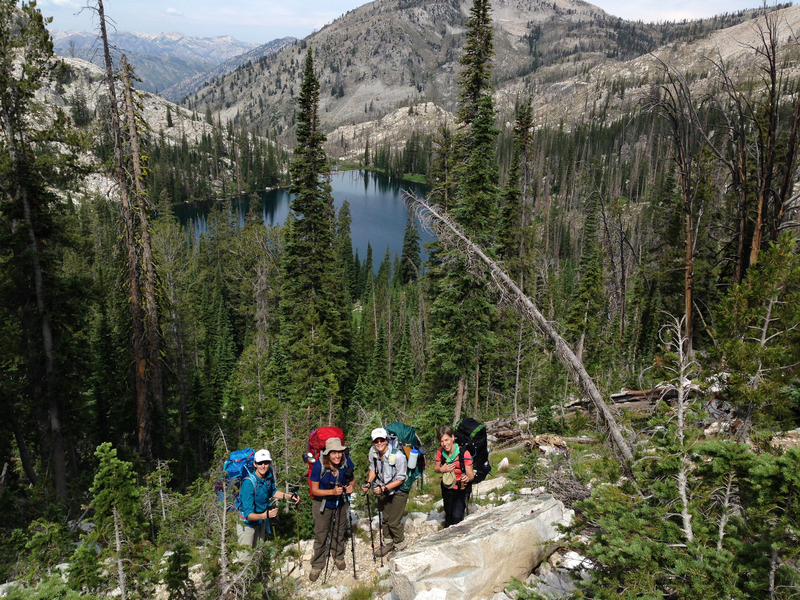 We arrived at Everly Lake on day 3 and stayed 2 nights using it as base camp for day hikes. Kelly and Bettina did the 6 mile round trip to Rockslide and the rest of us took it easy with a walk to Plummer Lake where we were rewarded with the sight of a regal Golden Eagle overhead. Everly is a beautiful, remote spot with views of the rugged sawtooth mountains that surround the teal waters of this alpine lake. Mosquitos were thick here so our head nets came in handy. From Everly Lake we hiked to the crossing of Nanny Creek and the Queens River, about a 6 mile trek. Based on the map and the guidebook description, we thought we were at the right spot where Nanny Creek crosses the Queens River but we didn’t see the creek. Eventually Bettina spotted a moss-covered sign high on a tree that said Nanny Creek so we knew we were in the right place. That evening we did some exploring and found an impressive waterfall about 1/2 mile east off the trail. We survived a dramatic thunder and lighting storm that night and the next morning we headed back to the Queens River tailhead. 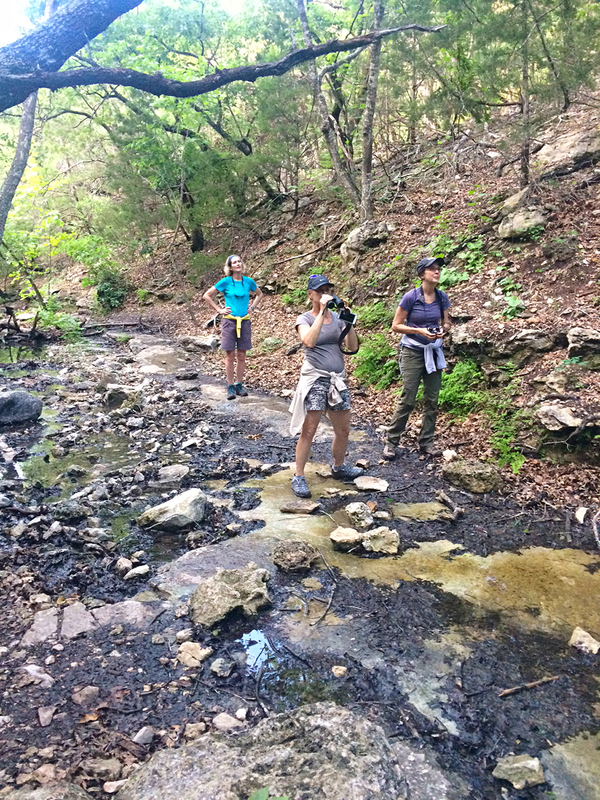 On the 6 mile hike back we encountered a few knee-deep creek crossings, a hail storm and several occasions of losing the trail. Thankfully we spotted a tiny orange flag on tree branch on one of the crossings that marked our way. Once back to our cabin we flipped coins for who got to shower first, ate burgers at the Beaver Lodge and soaked in the hot springs just outside of town. We can’t wait to explore more of the Sawtooths! Atlanta Natural Hot Springs were a treat after 6 days on the trail! Food Notes: Mary Janes Farm Outpost backpacking food was our favorite brand of prepackaged meals. REI sells it online and in some stores. Mary Janes Chilimac was the best of all we tried. Curry in a Hurry was Maria’s least favorite. Moon Cheese was also a big hit as was Backpacker’s Pantry Creme Brulee. 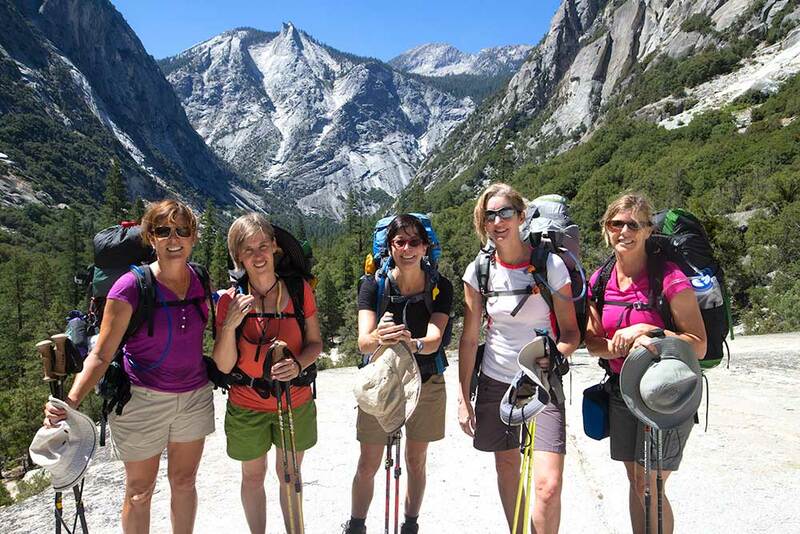 Gear Highlights: After trying three different backpacks, Suzanne loves her Osprey Aura AG 65. She says “Both the hipbelt and the harness are adjustable so I was able to dial in the fit. It also has a lot of great features like external pockets and the handy “stow-on-the-go” loops for trekking poles. It’s a keeper, for sure.” Maria and Suzanne both have a Sawyer Squeeze Filter System and we are all very happy with its performance and ease of use. Birds of the Trip: Golden Eagle, Bald Eagle, American Three-toed Woodpecker and the Black-backed Woodpecker. Check out more trip photos by Judy, Kelly and Maria. 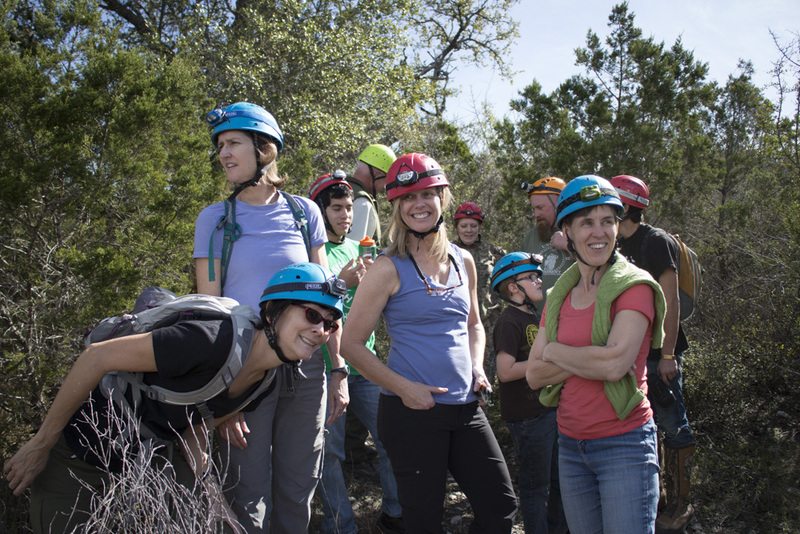 Suzanne, Maria, Kelly and Bettina all geared up and ready to descend into the darkness of the undeveloped Kickapoo Cavern. Campsite: After looking over all eleven tent campsites we settled on site 14. Since there isn’t any big advantages to one site over the other, our main concern was finding one with places for 5 tents. 14 was the winner. 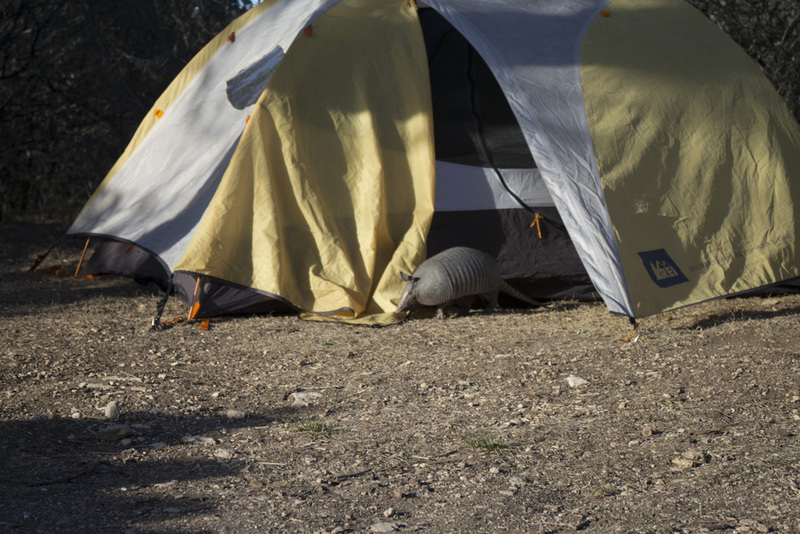 An armadillo, Olive Sparrows and a cardinal were there to welcome us. A friendly armadillo came by for a visit. Bird of the Trip: A pair of Olive Sparrows greeted us on our first morning. Along with our warm fire and fresh cup of coffee it made for a great start to our day of hiking. In the US, Olive Sparrows are only found in south Texas. Hiking: We arrived at the park at 12:30 on Saturday just in time for the cave tour. After the tour we did a short hike Saturday evening from our campsite to Seargeant Memorial Trail. 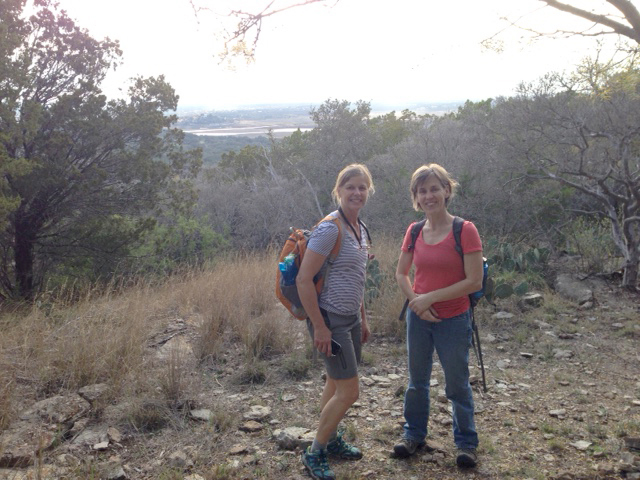 It’s a short, easy loop with a great view of the hill country. 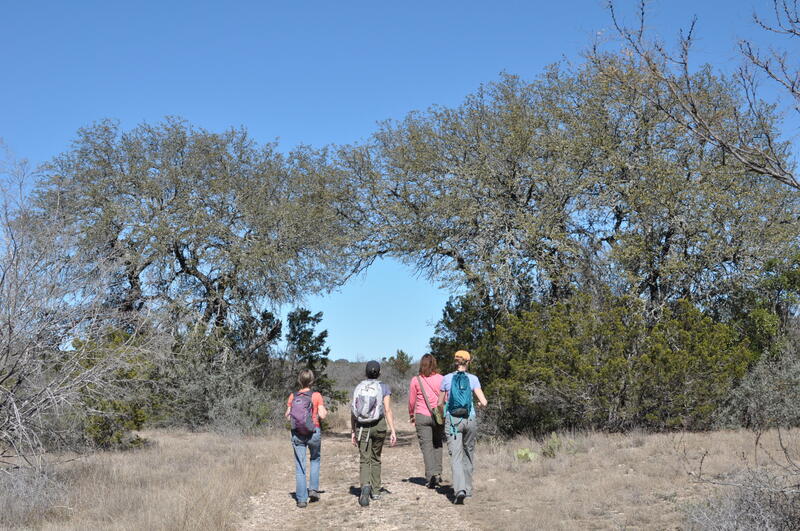 On Sunday we combined a hike up and back the Barbado Ridge Trail and The Long Way Home Trail. After finishing the Barbado trail we headed west on the road towards the trail head for The Long Way Home Trail and found no trail head marker. There is a marker at the east end of the trail. The Long Way Home trail is long but not difficult. 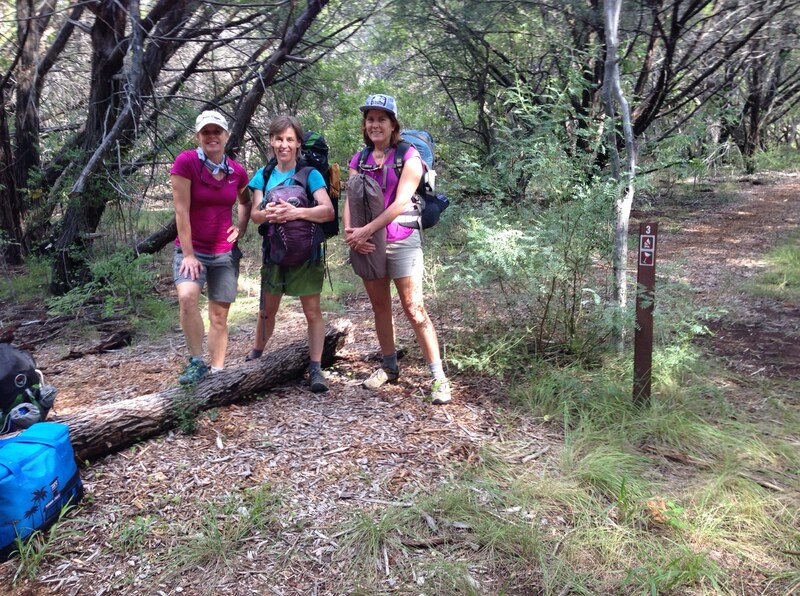 Later Sunday evening we hiked a combination of the Pine Canyon Loop to the Vireo Vista trail. It was a beautiful evening hike with good views. 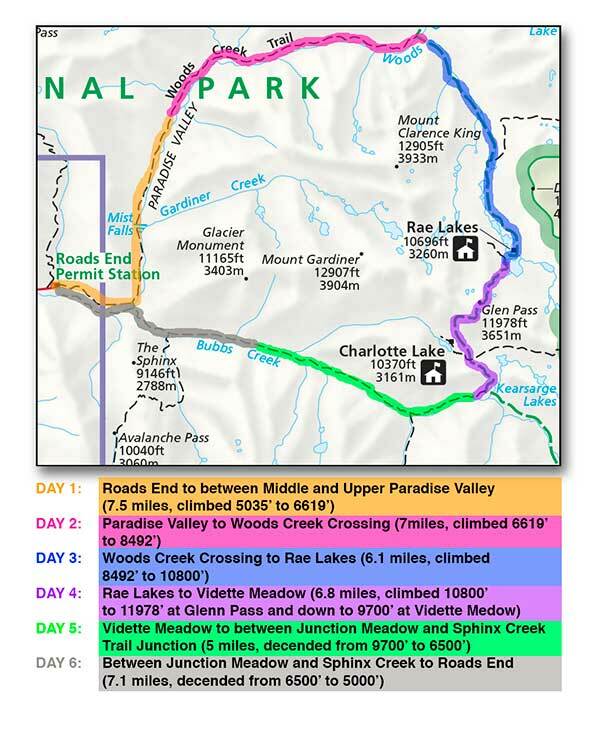 Below is a detail of the park trail map with our hikes highlighted, here is a link to the park map. View along the Barbado Ridge Trail. 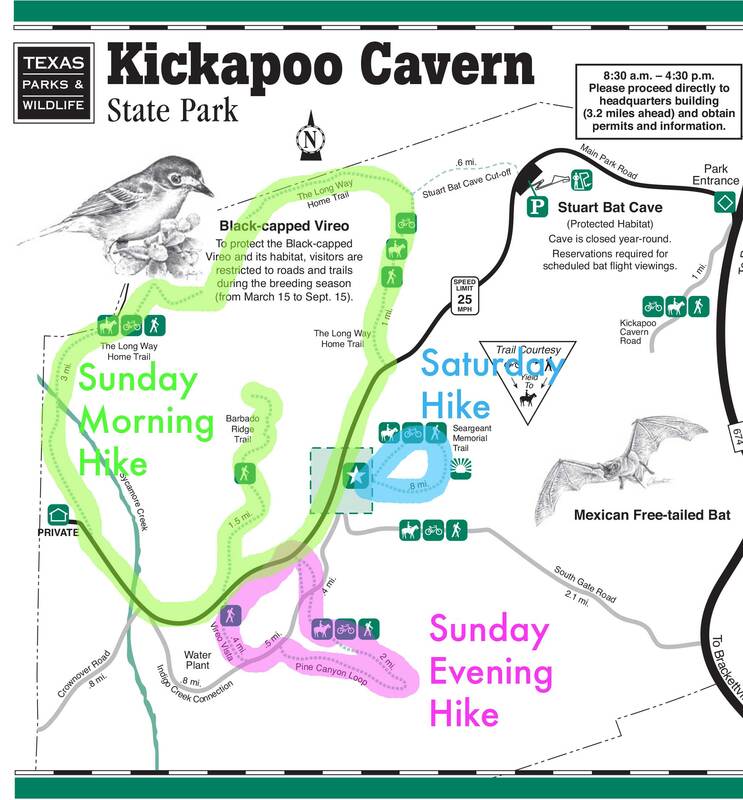 Highlights: Not being a big fan of dark places especially on a beautiful sunny day I was a little hesitant about the guided tour of Kickapoo Cavern. It ended up that we had an interesting, authentic, and fun adventure that definitely should not be missed when visiting the park. I truly could not see my hand in front of my face when our tour guide asked us to turn off our lights while deep into the cavern. The towers of flow stone where impressive and tales of the history of the cave stirred our imaginations. The tour takes about 2 hours, cost $10 and requires reservations. More info here. 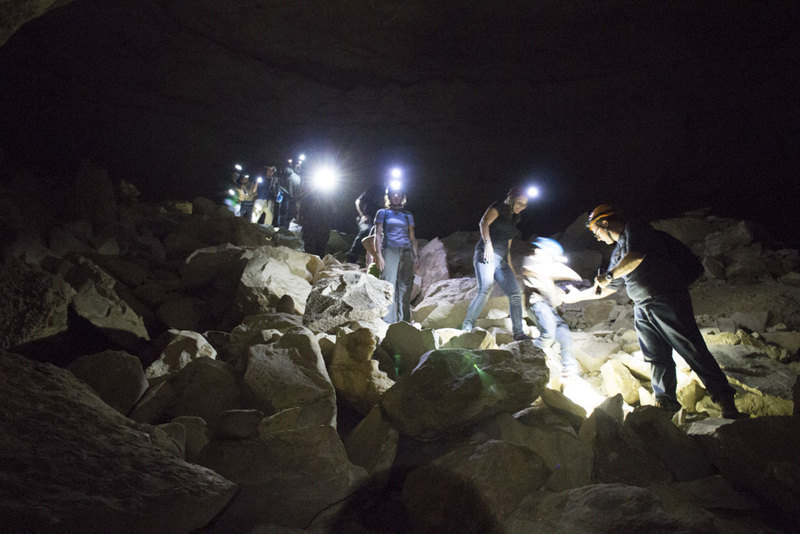 Descending carefully along the rocky trails inside Kickapoo Cavern. See all the photos from the Kickapoo trip here. Hiking: Saturday’s hike combined Peacock Loop (1.8 miles) and Juniper Ridge Loop (3.5 miles) east of the entrance to the park. On Sunday we hiked west of the entrance including Faris Lookout Trail (2.2 miles) Lakeside Trail (2.9), Rocky Point Trail and Bird and Butterfly Trail. 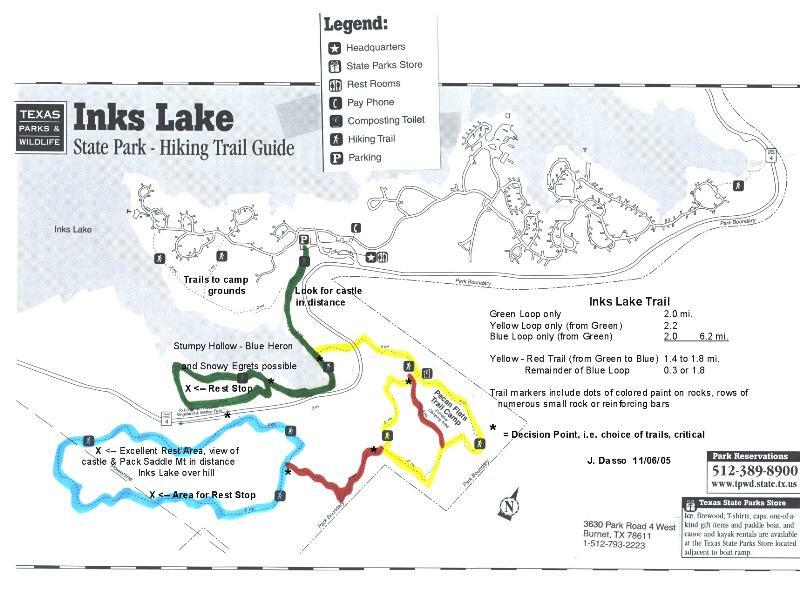 Below is the hiking trail map for the park with our hikes highlighted. 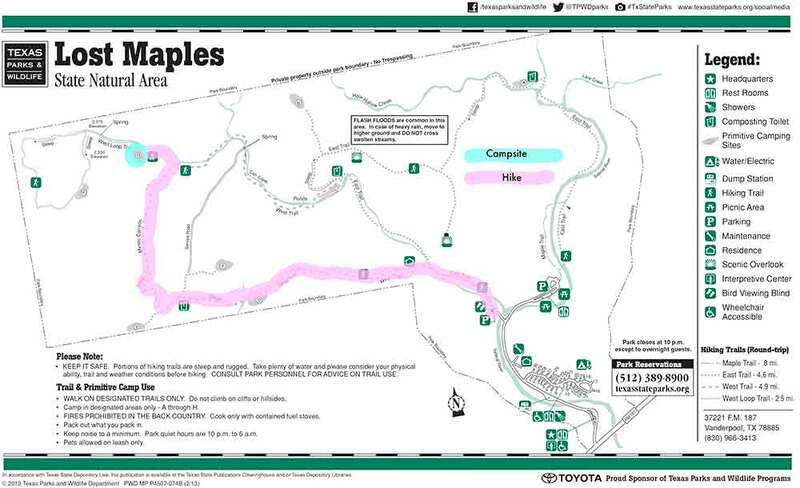 Here is link to the park map. Highlights: Campsite was very large, lots of room and private. In years past our campsite would have been a stone’s throw from the lake, but due to the draught, the area is covered in scrub and bushes. 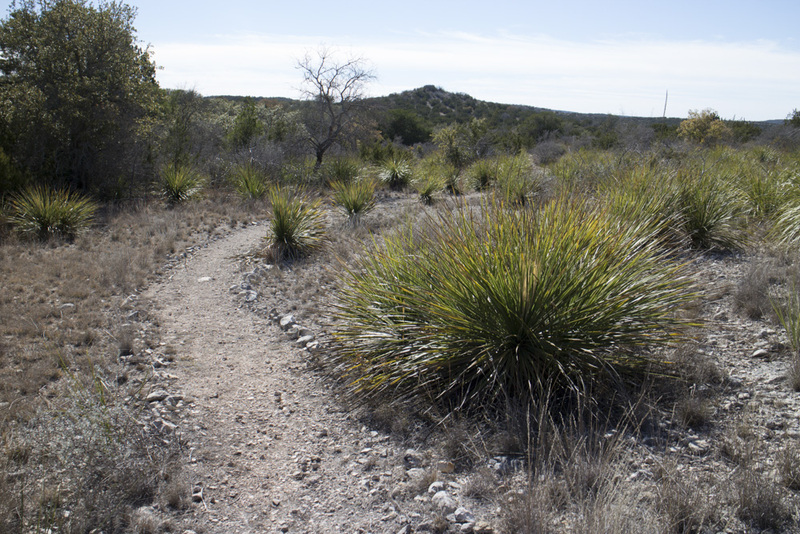 The LCRA park at Canyon of the Eagles has nice hiking trails that are well marked and include some good elevation. They also have amenities which campers can take advantage of at the Canyon of the Eagles resort. The best part of the campout was going to the Austin Astronomical Society Observatory where they had a big telescope set up. We happened to be there the night of a great meteor shower and we also saw stars in the Andromeda Galaxy which is the next one beyond the Milky Way.